Echinacea Root is well known as one of the most powerful immune system builders and stimulators! It works by first enhancing the quantity of immune cells in our bodies and then by stimulating them to action. a shorter duration of colds and flu. 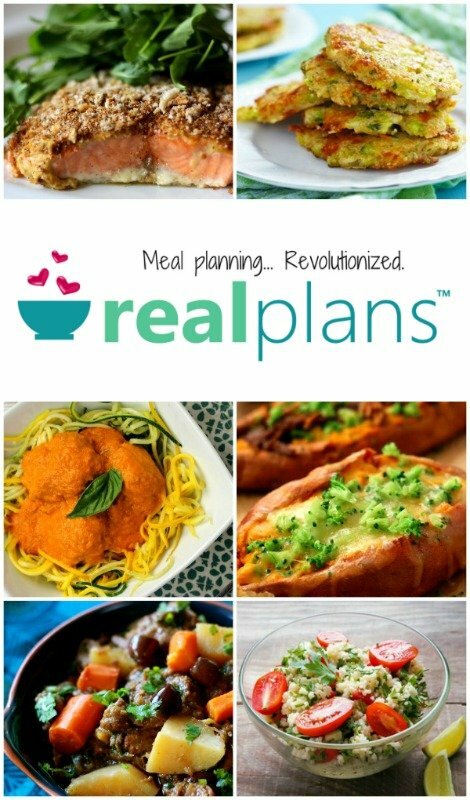 speeds recovery from chronic diseases. In my quest to create the perfect winter immunity booster for my family’s health, a Hot Echinacea Tincture was exactly what I was looking for! 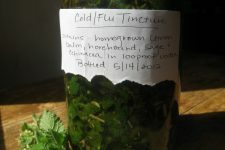 It combines some of my most favorite herbs for winter health! Echinacea Angustifolia Root — Naturally increases the actions and functions of the immune system. Eleuthero (Siberian Ginseng) Root — An adaptogen, that helps the body properly respond to stress. Garlic — The best broad-spectrum herb…well respected for it’s antibiotic, antiviral, antifungal and antiparasitic properties. 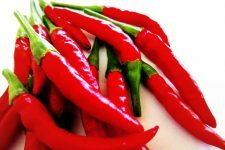 Cayenne Pepper — Capsaicin — the active component of peppers such as Cayenne, Habanero, Serrano, and Jalapeno — stimulates the body’s circulation and makes all of these already powerful herbs many times more effective! Please note: Part equals volume, not weight. As many herbalist recommend — and especially during the shorter days of fall and winter when the sun’s presence has deminished — I like to start this and all of my tinctures, if possible, on a new moon. Using a quart-sized glass mason jar, begin filling it with the herbs and dried plant material until it is 1/4 full. Add enough 100 proof Vodka to the herbs to cover them, filling the jar, leaving a 1/2 inch head-space. Set the jar on a counter in a high-traffic area and shake it as many times as possible throughout each day. Allow the mixture to steep at least until the following full moon (approximately 2+ weeks) if you’re in a hurry. However, it’s optimal to allow the mixture to steep until the following new moon (approximately 4 weeks). Strain the mixture through a cheesecloth or coffee filter. 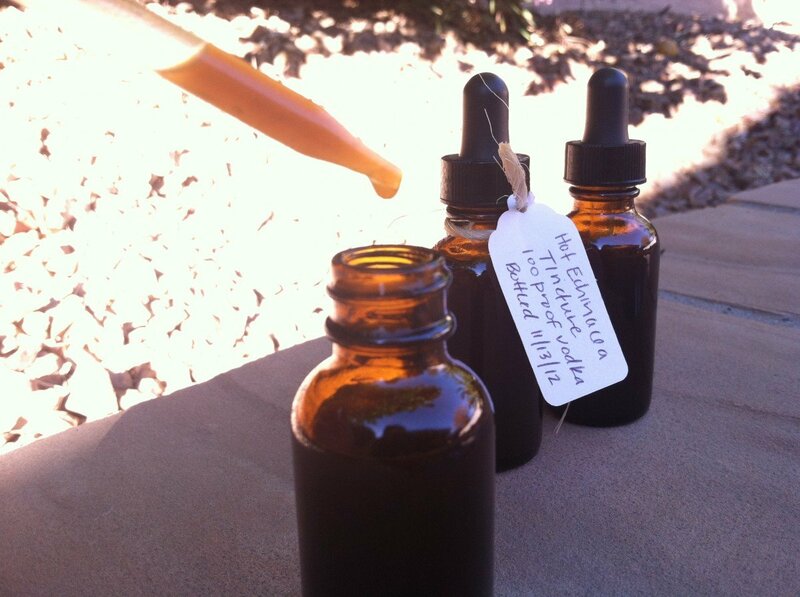 Label your tincture with the name, date, and contents. 35 drops (1 dropperful) 6 times a day for a week. 70 drops (2 dropperful) every hour while awake (not to exceed 8 doses), upon show of symptoms, for 2-3 days. I recommend calculating a child’s dose by using “Young’s Rule.” Add 12 to the child’s age then divide his/her age by that number. I will give her 33% of an adult dose. 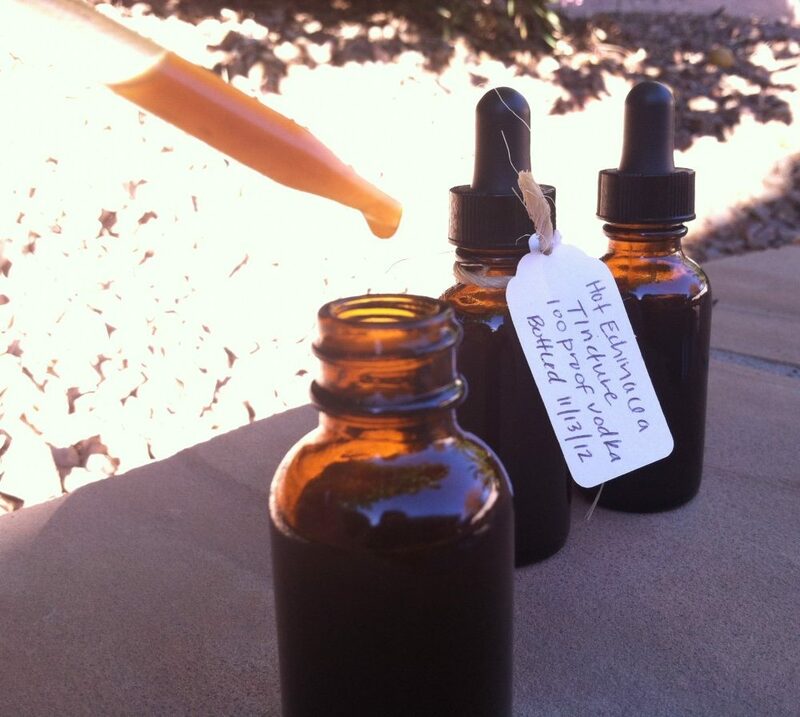 -I do have a very limited quantity of these tinctures available for purchase in my Etsy Shop. See the listing by clicking this link. 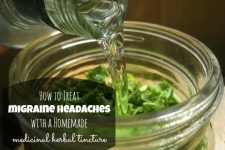 So, you take this tincture internally? I am new to herbal medicine and can you tell me if you get the same benefit from changing the alcohol to glycerin? I don’t use alcohol and wouldn’t feel comfortable buying it. Thank you for taking the time to teach us what you know and inspiring me to take control of what my family puts in our bodies. Thanks for including the formula for how to measure out a child’s dosage! Staying healthy during the winter months can be a challenge, but herbal remedies can provide safe and effective solutions to supporting the immune system. People often find it hard to stay healthy due to extreme cold weather but with these tips they can able to stay healthy in a natural way. Great question Shawna! You can use apple cider vinegar (ACV) or organic vegetable glycerin as excellent alternatives to the vodka. Thanks for letting us know that we can substitute apple cider vinegar ,water, organic Veg.glycerin , or olive oil. I plan to make this as soon as my plants are three years old. Thank you I willmake some up for a brother-in-law, he has alot of problems with diabites and well he’s been sick now for abot 4 months with sniffles coughing so i figure his immune system is low and he could use some..Thank you. I will make some with vodka and some without since my patrner is going on 16 yrs sober. Hi! I’ve been reading your website for a while now and finally got the courage to go ahead and give you a shout out from California. Just wanted to tell you keep up the fantastic work! I am eager to make this. How does this taste? Do you put the drops in some other liquid to take it? Thank you.